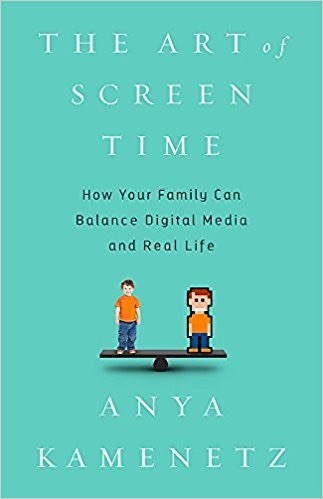 The Art of Screen Time: How Your Family Can Balance Digital Media and Real Life by Anya Kamenetz reviews the scant research on the subject and provides others’ stories and her own experience and advice. In short, she advises you to enjoy screens not too much and mostly together with your family. Parents and educators are well advised to read this book. How worried should we really be about kids and screens? Where is all of this heading, and what should we actually do about it—now, in the “real world,” a phrase that as of the early twenty-first century still has some meaning? These questions have resulted in this book. Anya belongs to the first generation of parents who grew up with the Internet. Now she is raising two members of the first generation growing up with screens literally at their fingertips. For this book, Anya surveyed over 500 parents along with as many experts on the subject that she could find. While real research is lacking, this looks like the best effort to date to define the problem and propose answers. The best evidence we have currently suggests that if you are functioning well as a family otherwise, there is a huge amount of leeway in the screen radiation your kids can absorb and still do just fine. The children of lower-income, less-educated parents, however, are both more exposed to screens at younger ages and are more subject to a host of other ills. Hypocrisy and inconsistency in boundary-setting makes for confused, sometimes angry kids—and lots of conflict. A better approach is to discover and unleash the joy of screen time with your kids. Particularly when shared, screen time can have meaningful benefits: creative, emotional, and cognitive. In a nutshell, enjoy screens, not too much, and mostly with others. The federal government hasn’t funded media research since 1982, and needless to say, many questions have presented themselves since then. The research on kids and screens is in its toddlerhood at best. It may seem that experts are just as confused as parents. It’s important to note that in order to get published, research tends to focus on the harms, and you can’t randomly assign babies to watch television or not. What’s happening all over the world is a giant experiment, and there is essentially no control group. The bulk of evidence we have about kids and screens concerns television. That’s all right because children still do more passive video watching than any kind of interaction with screens. Interactive media is different, but is it more harmful or more benign? What further confounds the research is that well-to-do parents are more likely to limit screen time and their kids will probably do fine anyway. Poor kids, however, are more likely to live in homes where the TV is on all the time, even if no one is in the room. Wealthier parents can hire sitters to entertain the child while the TV is off. Young children are obsessed by repetition. It helps them learn new words and concepts and provides touchstones of predictability within a chaotic and sometimes scary world. Electronic media satisfies this need for repetition. For tweens and teens, electronic media is a lifeline to the experiences they crave most: thrills, a space to explore independently, and 24/7 access to peers. Excessive screen time can interfere with sleep, which is necessary for allowing the brain to repair itself. Kids who give up exercise for screen time are prone to obesity. Now we take up the matter of low probability, high-risk issues. Some of the worst cases of video addiction stop hanging out with friends, stop talking to their families, stop coming downstairs for dinner, even stop going to school. Poor hygiene and obesity are also common. At some point, they become candidates for residency rehab programs like those offered to drug addicts. Reintegration after such programs can also be difficult. Here are the questions that doctors ask to determine if there is an addiction. 1. How often do you find that you stay online longer than you intended? 2. How often do others in your life complain to you about the amount of time you spend online? 3. How often do your grades or school work suffer because of the amount of time you spend online? 4 How often do you snap, yell, or act annoyed if someone bothers you while you are online? 5 How often do you lose sleep due to Internet use or game playing? If it is recognized as a stand-alone disorder, it can be covered by health plans and schools may have to treat it as a disability as they increasingly hand every student a laptop. Screen addiction is usually associated with other disorders like Autism, OCD, and ADHD, but so far we don’t know which causes which. Removal of screens, however, has caused symptoms of disorders to lessen in some cases. No screens at all before age two, according to the American Academy of Pediatrics was first uttered in 1999. The AAP now says that video chat, and other social purposes like looking at family pictures together, is probably okay for children younger than age two. While there is no evidence of harm caused to kids by screen time. the general consensus is that parents should strive for moderation. Two hours a day or less is a common recommendation. This entry was posted on Monday, March 12th, 2018 at 8:24 am	and is filed under Book Summaries, Education Books, Leadership Books. You can follow any responses to this entry through the RSS 2.0 feed. You can leave a response, or trackback from your own site.